U.S. Highway 2 crosses the Cut Bank Creek on Tuesday, February 14, 2017. A creek along U.S. 2 near Cut Bank. Cut Bank superintendent Wade Johnson dangled the prospect of thousands of dollars in loan repayment to potential teaching job applicants whenever he could. With a rural teaching shortage in Montana drying up applicant pools, and in a town where road signs point to Canada, he was eager to offer any benefit he could. When that program was defunded in 2017 amid a state budget crunch, it hurt, he said. “That significantly decreased the number of applicants we were seeing,” he said. One bill, HB 420, would have funded grow-your-own programs aiming to make teacher training more accessible for residents of rural communities and build pipelines for rural students interested in teaching. Another, HB 459, would have created a grant program to help rural schools with recruitment and retention. Dennis Parman, who leads the Montana Rural Education Association, said that the restoration of the loan repayment program was a top priority. He found the failure of other bills disappointing "to a degree," but not overly surprising. “It appears to me ... that the legislators picked one, and they weren’t going to be very supportive of having three,” he said. Malta superintendent Kris Kuehn takes a wide-ranging approach to hiring teachers amid the shortage, which he called "the single largest obstacle for rural schools." "(Adding) whatever tool we can have in our tool box to put quality teachers in front of students is the goal," he said. Having several tools is probably important, according to academic research on teacher shortages. Solutions likely resemble bricks in a wall; no one program will be a silver bullet. But pay is often one of the most important factors. Recently released survey results from a questionnaire of Montana educators showed that pay was more important than any other factor when teachers decided which jobs to apply for. The same survey confirmed what anecdotal evidence has supported for years, that pay is significantly lower in Montana's small, isolated schools compared to schools in larger cities. 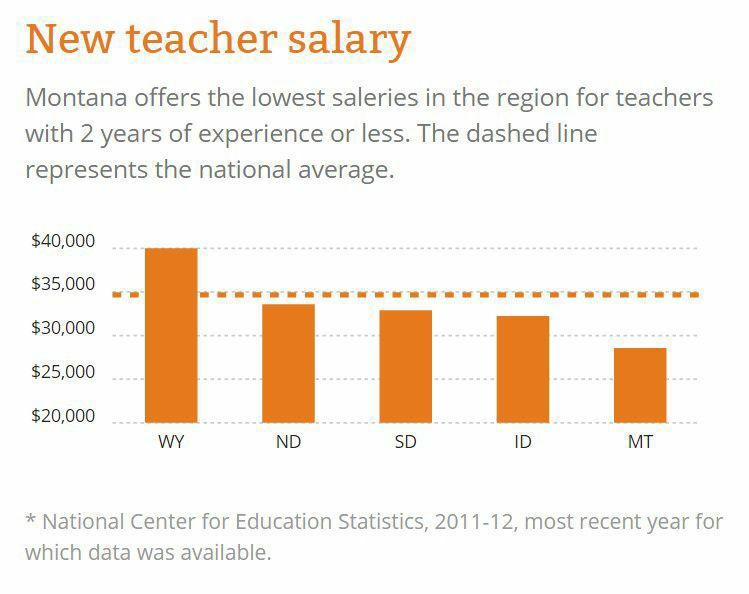 And average pay for Montana's rookie teachers was the worst in the nation, according to the most recent federal data. The pay ranking does improve for more experienced teachers, and the survey showed small improvements on the average pay for young teachers. When Johnson looks at factors like pay and location, combined with data that could suggest fewer teachers are entering the workforce, “that adds up to a very difficult hiring situation for those of us in rural schools,” he said. Even the loan repayment bill isn't as robust as it began. The bill's first version included an additional $4,000 payment that would have gone straight to schools for them to use to address teacher shortage. Johnson said Cut Bank would have likely used that for a signing bonus or related program. Changes to the loan repayment program in 2017 helped beef up its recruiting value. Payments are now $3,000 in year one, $4,000 in year two and $5,000 in year three, hopefully enticing teachers to stay for the full three years. The program previously paid $3,000 each year for four years. The bill would also loosen requirements for which schools could use the program, which could expand the number of eligible educators. If all of the 200 teachers the bill's fiscal note projects would be eligible to apply do so, then costs could be more like $800,000 per year — well beyond what the bill appropriates. The bill passed the House with strong margins, and was advanced unanimously out of the Senate Education and Cultural Resources Committee March 27. It still needs the endorsement of the full Senate and governor approval. In some cases, schools haven't waited for legislative action. Cut Bank already has a "grow-your-own" program, thanks to a partnership with a local alumni education foundation. Any Cut Bank graduate who studies teaching as a career can earn a $1,000-per-year scholarship, and if they return to Cut Bank to teach, there's a $3,500 signing bonus waiting. The program is only three years old, so it hasn't produced college graduates yet. “We’re anticipating hiring a couple next year,” Johnson said. Universities have also tried to address the issue; Montana State University holds rural school-specific events and training for future teachers and has a new degree program aimed at training teachers specifically for rural areas. Kuehn and Parman had optimistic views of how the legislature has addressed the rural teacher shortage. “It’s clearly understood by a lot of legislators that touch the process of education and appropriations,” Parman said. Johnson was more skeptical, reasoning that until the shortage affects larger schools it could remain a fringe issue.